The new Volvo XC90 continues the carmaker's tradition of performance, safety and styling. This popular luxury SUV is the most awarded car in its class and it's easy to see why. At Fields Volvo Cars Waukesha, we know that some customers demand an SUV that delivers on every front. For you, we are proud to present the Volvo XC90. Enjoy every road trip with the Bowers & Wilkins audio system that incorporates acoustics from inside and outside the car. You can set the system to three different modes. Choose studio, individual stage and Gothenburg Concert Hall to get just the right levels of volume and sound quality. Customize your listening experience as you roll down the road in total comfort. While you're there, connect your smartphone to the 9-inch dashboard touchscreen. 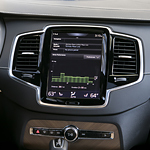 The new Volvo XC90 connects seamlessly to Apple CarPlay and Android Auto, making it easy to stay connected and stay informed.